This was a part-time effort, using mostly S&P rather than CQing. 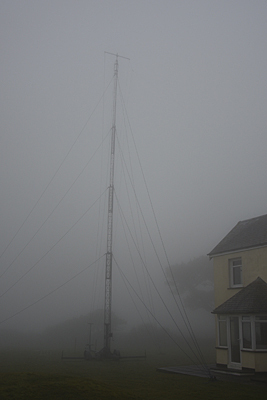 The weather was awful throughout the contest with coastal-fog and low cloud for much of the time. This was the first year when only a single vertical antenna was used. 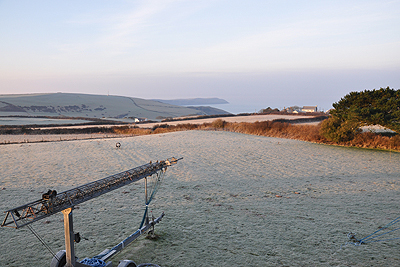 In previous years from Devon it has always been one or possibly even two dipoles. This year's vertical antenna was an Inverted L with a vertical section of about 80ft together with a 48ft horizontal leg. There were about 25 radials buried under the grass. The radial connections at the base of the vertical were all cleaned up with tradtional chocolate blocks being replaced by brass earthing lugs. There were two bi-directional Beverages for receive. These had both been recently improved and worked well. 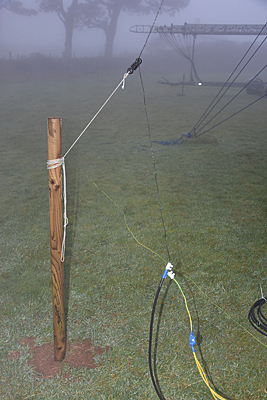 However conditions on 160m did not seem particularly good throughout the weekend. 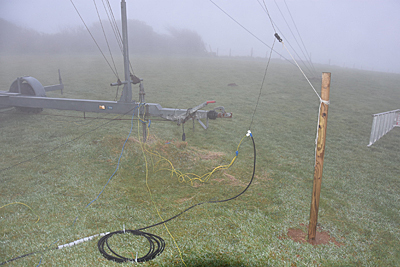 These photos taken in the fog show the 160m Inverted Vee antenna as well as the connections at ground level. It had been hoped that the use of a vertical would finally allow me to work my first ever Chinese station on 160m, but this did not happen. About four or five different Chinese stations were heard during the weekend, but none of them was loud enough to even consider calling. No JAs at all were heard during the contest. However JT5DX was worked, but with great difficulty, indicating that conditions to the Far East were really poor. In the other direction 140 USA and 13 Canadian stations (with just a couple of West Coast stations) were worked, but again with poor signal levels. <---160m Inv L antenna with an 80ft vertical section and about 48ft horizontal. However there was a long list of nice potential multipliers that were heard (or more likely just "seen" on the RBN screen) but that were not worked. These included : 4O4A, 9K2NO, 9M4DXX, A61EK, A65CA, BA4DL, BD1RX, BH4IGO, BY1CW, E2X, EK3GM, ER4A, HH2TT [?] HI3Y, IS0, KP3W, TK0C, VU2CPL, XE1XA, XE2T, YC1ZAZ and YE1K.